Color(s): Fawn, mahogany; with black overlap. The mask and ears are black. 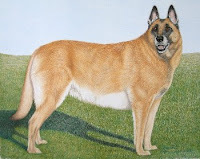 The Belgian Shepherd Malinois is one of the four breeds of Belgian Shepherd dogs which may be listed as a variety of the Belgian Shepherd Dog rather than an individual breed. The other three breeds are the Tervuren, the Laekenois, and the Groenendael. They are very few in the United States, but are popularly used as police dogs.